On Tuesday, the Acadiana Fly Rodders hold their monthly meeting at Grace Presbyterian Church on 415 Roselawn in Lafayette. Time is 6:30pm. Guests are welcome. On Wednesday, the Pontchartrain Basin Fly Fishers holds their monthly general meeting at Abita Brew Pub on 72011 Holly Street in Abita Springs. Time is 6:00pm. Guests are welcome. For more info, go to www.pbasinflyfishers.blogspot.com. On Saturday, Orvis of Baton Rouge will hold an "Advanced Casting Course". There are three (3) two-hour sessions: 11:00am, 2:00pm, and 4:00pm. Each session has a limited class size so pre-registration is required. There is NO cost for each session. The class will focus on improving basic casting skills to the next level. To register, call 225-757-7286. Also on Saturday, the Backpacker of Baton Rouge will hold a free "Paddle Demo Day" at BREC's Wampold Park on Stanford Avenue adjacent to University Lake. Time is 10:00am to 2:00pm. Models include Hobie, Wilderness, Perception, Mad River, YOLO, and others. In case of inclimate weather, check their Facebook page to confirm, or call 225-925-2667. No knock stumpknockers. The biggest bream of the year bed in April and May. Great reports are already coming in from some flyfishing hotspots like Highway 51 canals, Chicot Lake, Miller Lake, Nantachie, Cane River, Caney Lake and more. Most of the fish are coming on popping bugs, Jitterbees, Slow Sinking Spiders, Fluff Butts, and various beadhead nymphs like the Rosborough Hares Ear. When fishing the beadhead flies, a tiny strike indicator with the fly suspended 2-3 feet below is deadly. Slow Sinking Spider. 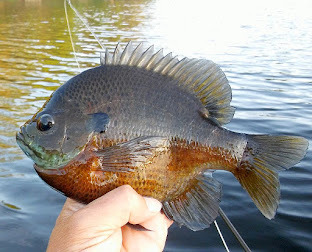 Originated by Stephen Robert of Houma, the SSS in recent years has become a favorite for bedding bluegill across the South. As it's name implies, it sinks slowly. A twitch as it descends often draws a strike from big, and otherwise cautious, gobbules. 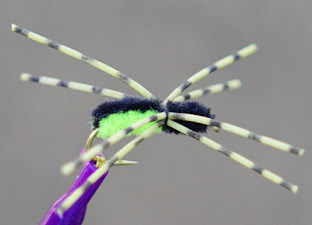 Materials used to make this fly are a size 10 long standard nymph hook, fine chenille or ultra chenille for the abdomen, backstripe and thorax, and barred round rubber legs. Best colors we've "tested" are black/chartreuse, gray/white, light blue/white, and light purple/white. 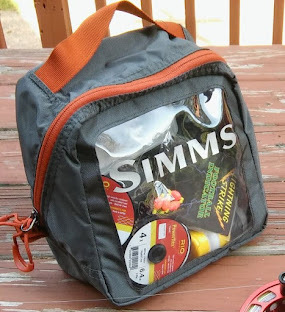 Simms Challenger Pouch. This might be the most useful accessory I own! This 8-inch by 7-inch pouch is great for holding spools, tippets, camera, finger guards, or any other items I don't want loose in my large gear bag. It can also be used to hold up to four fly reels. The pouch features dual zippers for better access and a transparent front that makes it easy to identify what's inside. MSRP is only $15. Kudos to the North Louisiana Fly Fishers! kayak fishing, conservation, and outdoor ethics. Copyright 1997-2018. All rights reserved.